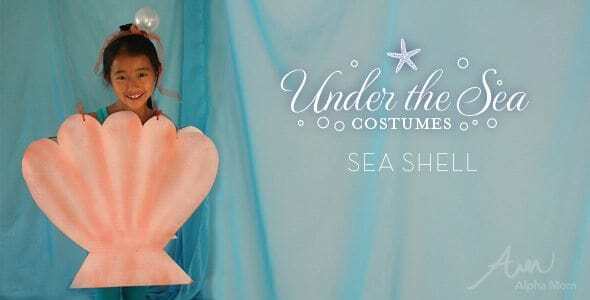 Prev Easy Classroom Halloween Treats Next DIY Under-the-Sea Costumes: Submarine! 7. a large pearlized christmas ornament (not too big though—ours was a little heavy and the headband had to be reinforced with a butterfly clip so it didn’t slip off) or any big bead that can be made to look like a pearl. 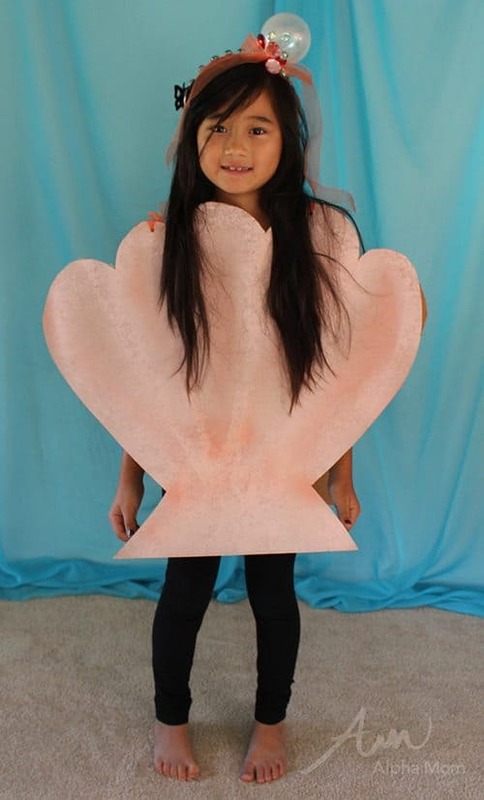 First you will need to cut your seashell shape out of the cardboard. Draw your shape on the cardboard with pencil and then use a box cutter to cut it out. It’s easiest if you use a smooth arcing motion with your hands to get the scalloped edges. After you’ve cut out your shapes, paint your shell. Leave light and dark areas that follow the ridges of a shell. When your paint is dry, cut (or use a heavy-duty hole puncher) two holes in the top of each shell where your ribbons will go. Lace ribbon through to create a sandwich board. I used two really inexpensive dollar store headbands to create this look. I taped them together at both ends and in the middle with a piece of masking tape. Then I took my ribbon, taped it at one end and wrapped it around and around the headband until I got to the other end. I secured the loose end of ribbon to the headband with another small piece of making tape. To attach the “pearl” (aka Christmas ornament), I used floral wire and wired it to the headband. Hot glue or quick-acting glue might work well here too. I then covered my wire with more ribbon, securing it by tying it in a pretty bow. Then I hot-glued some costume “jewels” and flat marbles to complete the pretty under-the-sea bubbly look. Add leggings and rubber boots and you are ready to catch a trick-or-treat wave! Crafting time: 1/2 hour to an hour, depending on how fast your paint dries and how much of a perfectionist you are when it comes to making headbands. Feel free to simplify my steps. *Box cutters are NOT for children. Have a responsible adult use any sharp cutting devices. **Always spray paint outside or in a very-well ventilated area. Use non-toxic (low VOC) spray paint or ask your paint store to put no- or low-VOC paint into a spray can for you. *** Hot glue can burn. Be careful, use common sense and don’t allow children near hot glue until it is cooled. Find Halloween costumes, crafts, treats and decorations from our archives here.